And I thought Americans were the only ones who McCheapened mass taste buds. Many McThanks to Keith Lichtenauer who found this sign while checking out the culture in Luzern, Switzerland. 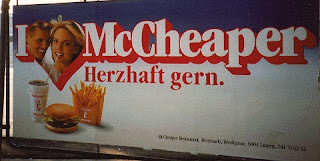 My McCheapass roommate and I were visiting Luzern in 1991 and we came across this sign. We wasted the whole evening trying to find the restaurant only to find them McClosed and we wound up eating at McDonalds at the train station anyway.